Laundry rooms are on of my favourite spaces to design. I’m not sure if it’s because they are often dark and dingy neglected spaces where storage items go to die (anyone remember what my laundry room used to look like?! ), or if it’s because it’s an area where so much care happens for a family (we do minimum one load a day for my family of 8), but whatever my attachment, I just love the opportunity a laundry room presents to do something fun! In my newest sponsored makeover at the lovely Jenn Pike‘s home, we created a customized laundry room for her family of four. This space presented quite the design dilemma as it has to serve a lot of purposes. Jennifer’s home has no garage, no basement, and no outdoor shed. So this room has to fit off season clothing, sports equipment, paint cans, and random odds and ends. 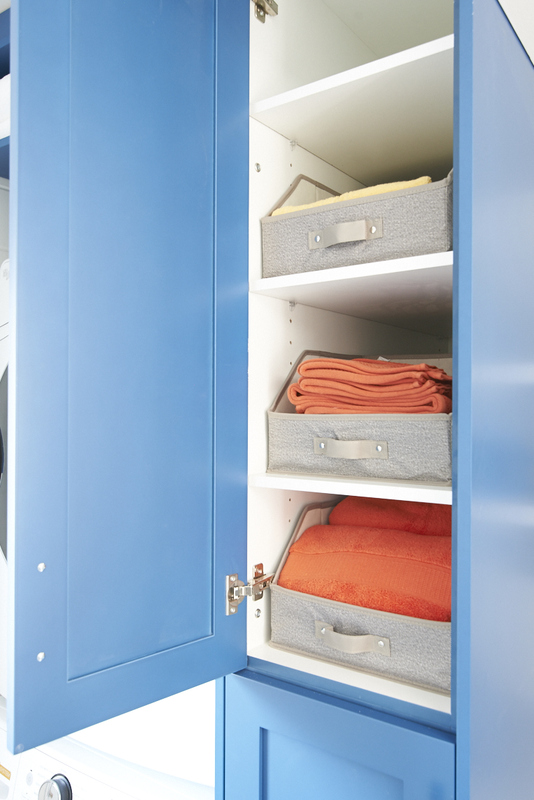 Plus, it has to function as a space to wash, sort and fold clothing! 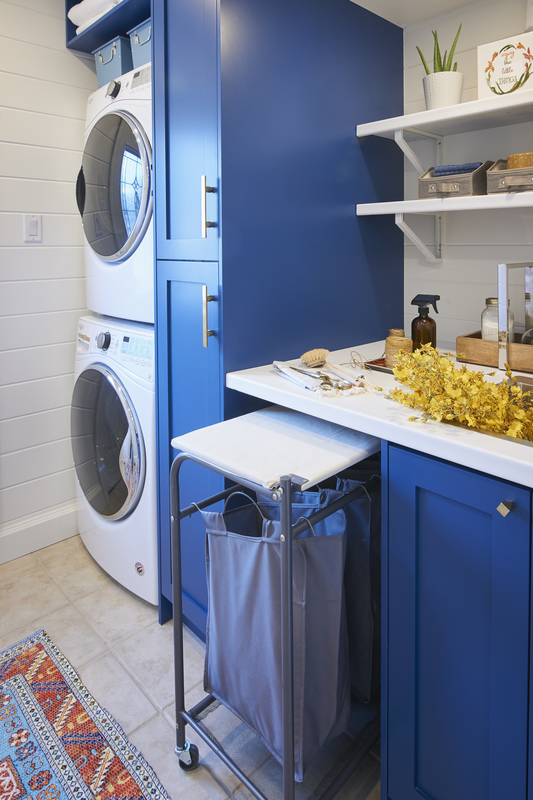 If you’re looking to give your laundry room a refresh soon, here are a few ways you can add some custom elements to your space. on the custom cabinets and picked up the colour in this beautiful patterned rug from HomeSense, and these striped towels by Pamuk and Co. Bright, bold colour in any application (but especially in painted millwork!) can really make a space look and feel more custom and original. Another way to instantly make a space look more custom is to add architectural details. 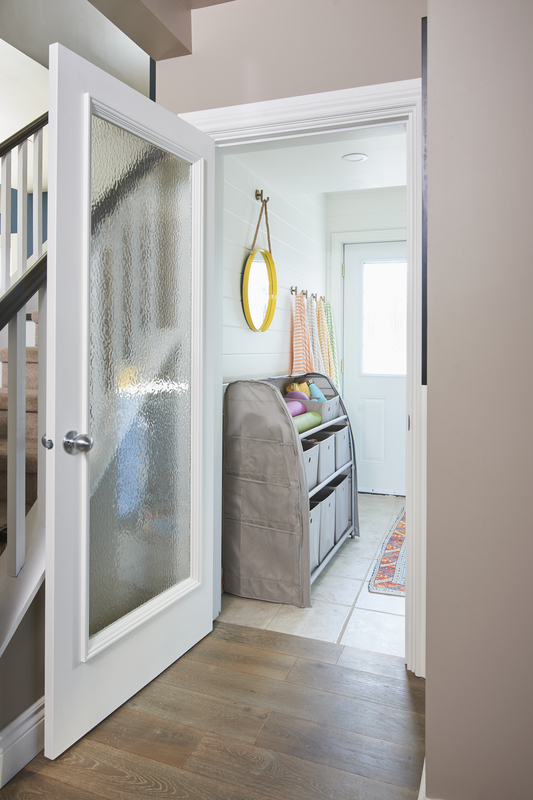 We changed the swing on the original door to open against the staircase to maximize the space in the actual laundry room, and replaced the interior door with this beautiful Metrie Pretty Simple door with Millenium patterned glass. In addition, we wrapped the entire room in Metrie’s MDF tongue and groove to create a shiplap look. I like shiplap (and all mouldings, really) as it provides a subtle texture to a room. And I am all about wrapping it on every wall, especially in small spaces. Strategic storage makes me REALLY happy. Proper storage is essential to keeping a space clutter free, and a family from feeling overwhelmed by stuff! I designed the millwork here 36″ deep to give the family LOTS of space for large, bulky storage. But to make sure these large cavities remain really practical, I used a series of large, easy view bins by neatfreak .to keep things that require more frequent access like towels and cleaning supplies in plain sight. 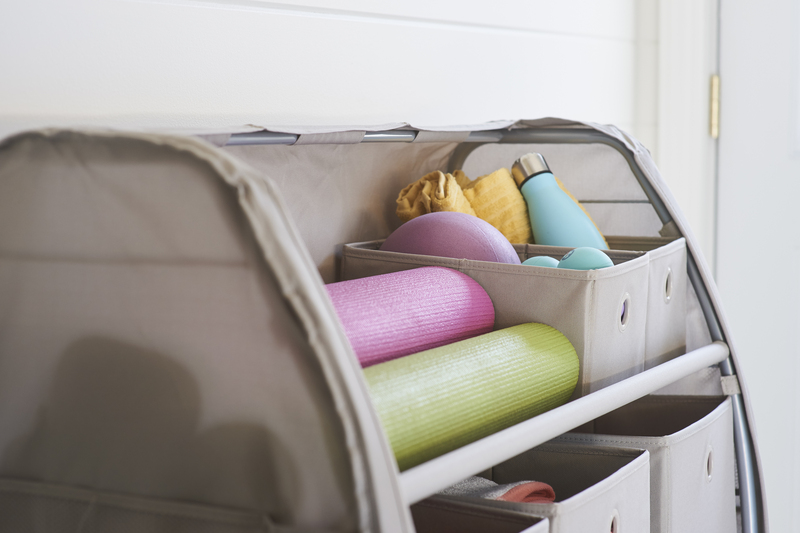 This 3-Tier Home Storage Organizer by neatfreak provides ample storage for Jenn’s collection of yoga gear and hides pool toys and sports equipment conveniently close to the backyard entrance. I like the portability of this unit- the entire thing can be picked up and brought outside for easy access. With space at such a premium, I had to maximize literally every available square inch. This triple sorter laundry system with built in ironing board by neatfreak allows Jenn to create an additional surface area for laundry sorting and folding, and eliminates the need for a folding ironing board, saving precious storage space! 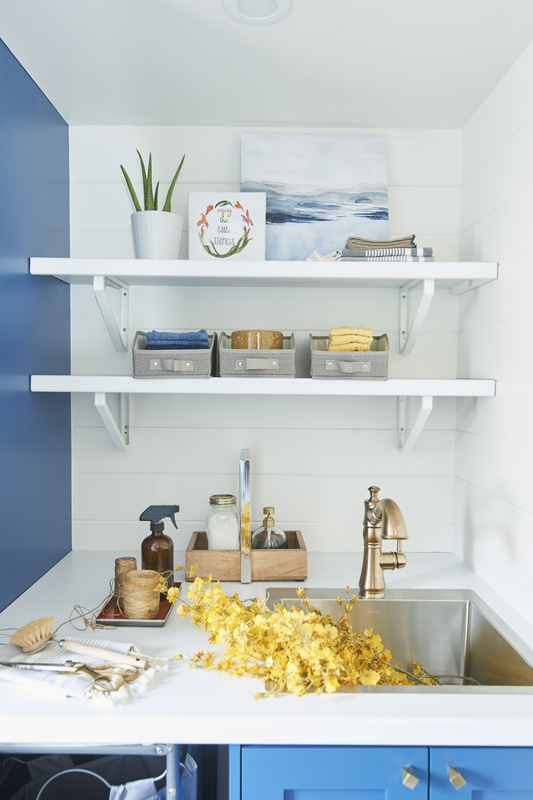 Lastly, we created custom floating shelves out of the same Belanger laminate counter we used to provide room for additional storage and decorative display. They key to customizing storage is to think of the specific activities that need to be performed in a space, and then select the bins or systems that will make it easy for you to stay organized. 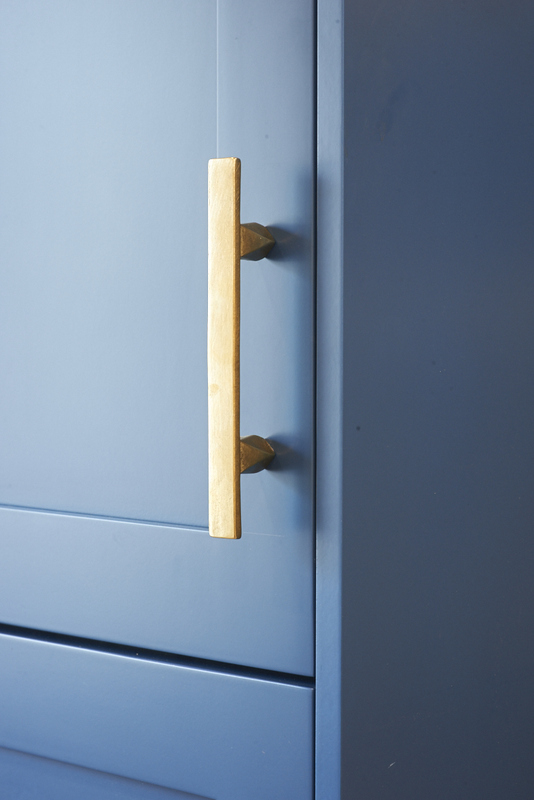 I love me some handcrafted cabinet hardware, and these pieces by Shayne Fox Hardware are my current obsession. These bright bronze pulls and knobs are made out of cast bronze, and are finished in what is called a “living finish”- they are going to oxidize, and patina over time. With Jenn’s commitment to natural living I thought this collection was such a great fit for her family. 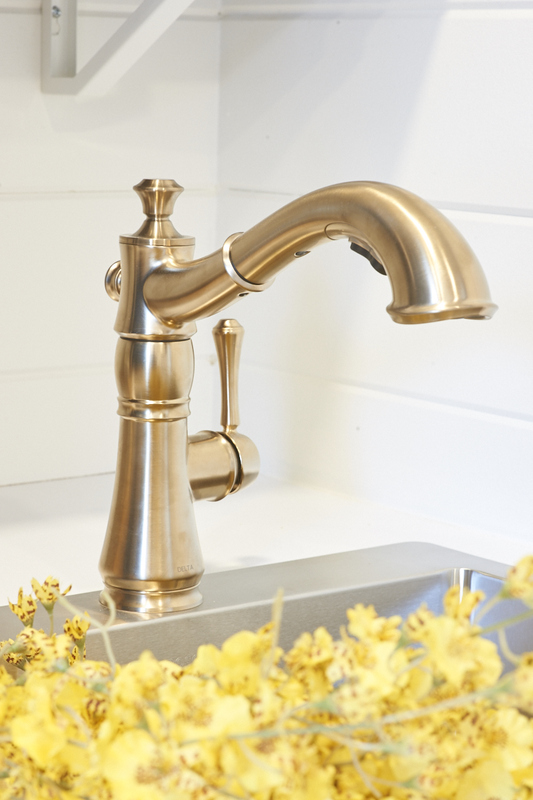 And we continued by obsession with all things bronze with the Cassidy faucet by Delta in Champagne Bronze. 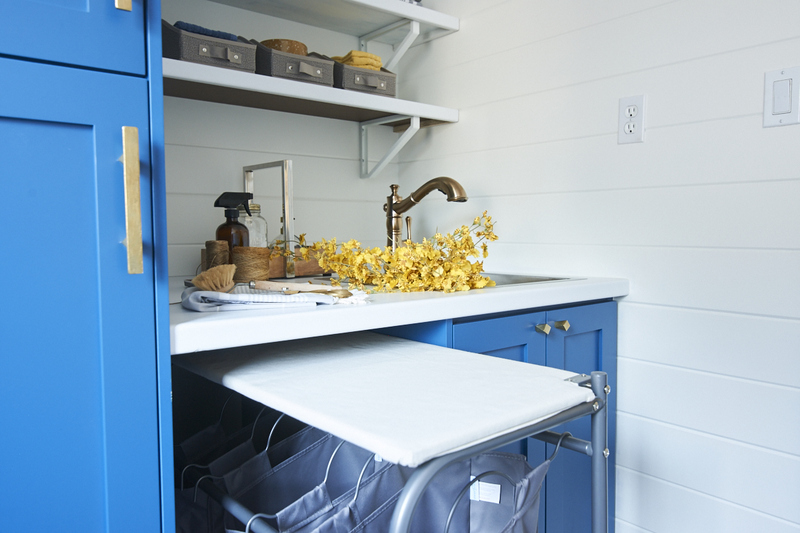 A small hit of a warm metal is a really on trend way to provide a custom element in your laundry room. And finally, don’t forget you can customize the most important aspect of your laundry room, your washer and dryer. 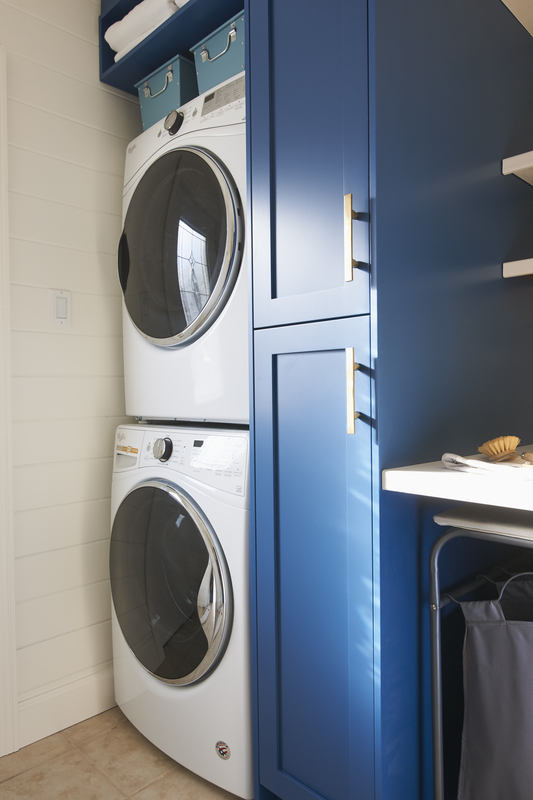 We selected a stackable washer and dryer by Whirlpool to maximize all available space. The front load machines offer a multitude of settings that allow Jenn’s family to wash and dry everything from well worn sports gear, to delicate dance costumes. The Load & Go system holds enough detergent to wash 12 loads of laundry, so you can fill it and forget it while the Precision Dispense releases the right amount of detergent at the right time so all your family’s clothes receive the best care. Available in three finishes, we went white as a bold contrast against the blue cabinetry. Creating a space to provide the care for a family that laundry is so important- I hope this makeover gave you some ideas to try in your own space! Special thanks to the brands mentioned above for providing product and partnering with me on this project. I love recommending products that will make a family’s life more beautiful, and easier. Opinions are very much my own!